Tough choices • LDS Church opposition to legislation has forced soul-searching and pain for those personally affected. Francisco Kjolseth | Tribune file photo Dallas Sainsbury, 23, who suffers from Crohn's disease gave emotional testimony in favor of Sen. Mark Madsen's medical marijuana bill, SB73. Sainsbury and her mother formally resigned their membership in the LDS Church after the faith came out in opposition to the bill. 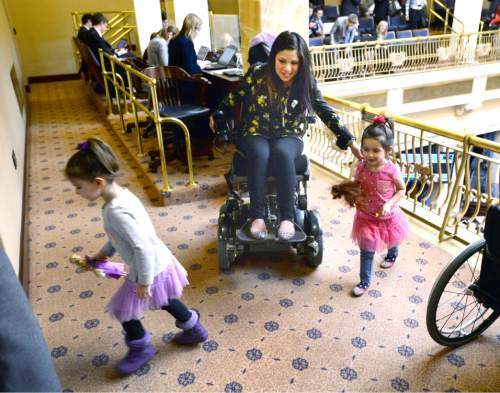 Steve Griffin | The Salt Lake Tribune Enedina Stanger has moved from Utah to Colorado so she can legally use medical marijuana to help relieve the painful symptoms of a rare disorder she suffers. A Mormon, Stanger says her decisions have not been well received by her LDS family at a time when a strong support system is needed most. 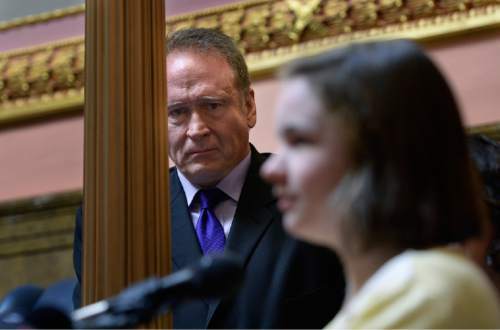 Scott Sommerdorf | Tribune file photo Sen, Mark Madsen, R-Saratoga Springs, reacts with some emotion as he listens to sixteen year old Maddie Campbell speak about how she was helped by medical marijuana. The Campbell family has had to make tough choices given Utah's current law and the position of the LDS Church. "Every day we commit a felony to save our daughter's life," says Maddie's father Aaron. 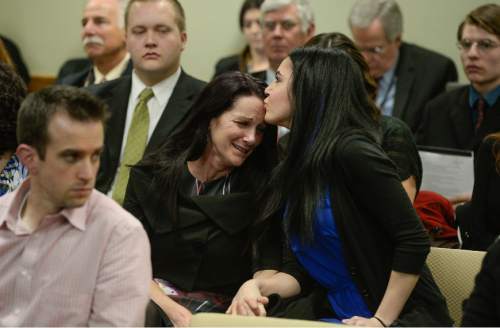 Francisco Kjolseth | The Salt Lake Tribune Debbie Sainsbury, left, becomes emotional as she gets a kiss from her daughter Dallas Sainsbury, who had just given moving testimony about her intense suffering from battling Crohn's disease. For Dallas -- already frustrated with earlier positions the LDS Church had taken on gay and lesbian issues --the faith's opposition to a medical marijuana bill was the breaking point. Days after the church's Feb. 5 pronouncement, Dallas and Debbie mailed the church a letter resigning their membership in the faith. 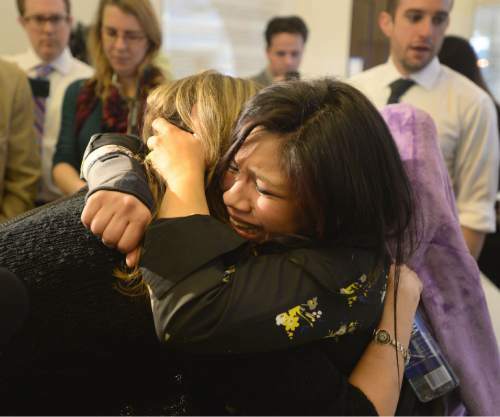 Steve Griffin | The Salt Lake Tribune Weeping with joy, Enedina Stanger, right, who suffers froma rarely diagnosed disorder that causes a mutation in her collagen, hugs Christine Stenquist, a long time advocate of medical marijuana, outside the Senate Chambers on Thursday. SB73 passed the Senate and now moves on to the Utah House. 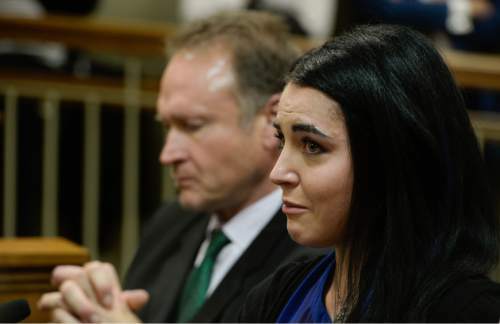 Her decision to use medical marijuana has not been well received by her Mormon family. It started with a faulty memory and a little clumsiness in Aaron and Emily Campbell&apos;s oldest daughter, Tori. Within a few months, their world had collapsed. Tori was diagnosed with a degenerative neurological condition, metachromatic leukodystrophy, a genetic illness that they learned also afflicted Tori&apos;s sister, Maddie, and brother, Ike. Despite bone marrow transplants and chemotherapy, Tori died in September 2014 and Maddie&apos;s condition was deteriorating. "We were at a loss," said Aaron Campbell. "Maddie was dying. We had just buried Tori, and the prospect of watching our daughter just wither away in a wheelchair was not something we were going to stand for." Desperate and on the insistence of a friend from California, the Campbells gave Maddie medical marijuana; the results were striking. Her seizures abated, she was able to think more clearly and, most remarkably, Maddie was able to get out of her wheelchair and walk. After months of giving Maddie the drug, Aaron Campbell and a former LDS missionary companion  a doctor whose daughter had been diagnosed with a brain tumor that was expected to kill her  wondered where their church stood on the issue of legalizing medical marijuana in the state. The two wrote to their former mission president, who had become a general authority, to find answers to their question. The response came from physician Gregory Schwitzer, chairman of Missionary Department Health Services at The Church of Jesus Christ of Latter-day Saints headquarters. "This is my understanding," Schwitzer wrote. "In states where the medicinal use of marijuana is approved legally and given under the guidance of a licensed physician, the church has [no] position." Legal drugs and medications that are used recreationally, he said, "can be a great problem." "Similarly, the use of medicinal marijuana can be a great blessing to individuals who are suffering with these diseases in which other treatments have failed," he wrote, "yet to use it recreationally and without appropriate medical supervision can be a major problem." For Campbell, the email last year "really brought me a lot of peace." Opposition • But that tranquility has been disrupted this month when the LDS Church issued three separate official statements on a bill before the Utah Legislature that would legalize medical marijuana. In them, the state&apos;s predominant faith focused on concerns about controlling a drug that is illegal under federal law. It leaves faithful Mormons who are users of medical marijuana facing twin dilemmas: Like any other user of the drug, they are breaking the law; on top of that, many are trying to square their use with guidance from leaders of their church. On the other side of the equation is the drug&apos;s benefit for patients or their loved ones. As Campbell put it: "Every day we commit a felony to save our daughter&apos;s life." When the LDS Church issued its first statement opposing SB73 on Feb. 5, many of the Mormon advocates who had been working toward passage of the bill fell away from the movement. Others remained involved, but were clearly disappointed that their faith had taken such a position on the legislation. For Dallas Sainsbury  already frustrated with earlier positions the church had taken on gay and lesbian issues  it was the breaking point. Days after the church&apos;s pronouncement, Sainsbury, who found relief from her Crohn&apos;s disease through marijuana, and her mother mailed the church a letter, resigning their membership in the faith. Opposition to SB73 notwithstanding, the LDS Church&apos;s position when it comes to the use of medical marijuana is more nuanced. In its second statement on the issue, the church noted that marijuana remains illegal at the federal level, but members of the faith in the 23 states and Washington, D.C., where medical marijuana is legal can use the drug and remain in good standing and attend services in temples. Some ecclesiastical leaders in states like California are said to be users of medical marijuana, and when Nevada legalized cannabis in 2013, it was an LDS stake president, Republican Sen. Mark Hutchison  now the state&apos;s lieutenant governor  who sponsored the legislation creating the program. Personal stories • Sen. Mark Madsen, R-Saratoga Springs, who has acknowledged having used marijuana in Colorado to treat his chronic back pain, said his bishop was among the first people he consulted with before trying the drug. "The first conversation was with my physician, and we thought we might actually do it, and I talked to my wife and that was the next question: What is the spiritual implication?" said Madsen, sponsor of SB73 and a grandson of the late LDS Church President Ezra Taft Benson. "So I went to my bishop and he was very forthright, and just said, &apos;Try it in Colorado. As long as you&apos;re in a place where it&apos;s legal, I&apos;ll issue the [temple] recommend. So that&apos;s how I dealt with it." From a legislative standpoint, Madsen said he views the church as "any other special interest," entitled to engage in  but not dictate  the dialogue. "I&apos;m disturbed to the extent that they try to connote a moral imperative where there is not a moral imperative," he said. "I never felt a conflict spiritually throughout this or throughout my service in the Legislature. I&apos;ve clashed with them on a number of issues over time, and this was no different." Likewise, Enedina Stanger sees no conflict between her religion and her marijuana use. The young mother was arrested last year for using marijuana to treat a disease that attacks her joints, allowing her limbs to dislocate, causing intense pain and shredding her tendons. She moved her family to Colorado to finish her treatment. Stanger&apos;s father was an LDS bishop and is a former FBI narcotics agent, and she said she went to her bishop and prayed about her decision to use medicinal cannabis. Stanger tried it the first time when she was suffering from a seizure and within minutes the muscle contractions began to subside. After a few more uses, she said, her nervous system stabilized, she was able to communicate with her husband and read a book with her daughters. But her decision to use marijuana was not well-received by her Mormon family. "I have been, let&apos;s say, put aside for a lot of the LDS community, so I do know the hurt and the rejection to have something that affects your life so personally and not have the support we all wish we could have," she said. "I am trying to represent the doctrine and gospel that I know to be true. I study the scriptures every single day. … I know that medical cannabis was put here because it is for its intended purpose and that is for medicine. And the minute I used it, I knew it was a miracle." Brian Stoll said he benefited from taking marijuana, but when faced with a choice between using the drug and being married in the temple, he chose the latter. Stoll was playing tag in a dark theater building at Brigham Young University as part of a singles ward activity when he plunged about a dozen feet into a darkened pit, breaking his neck and back. He began taking marijuana to cope with the debilitating pain and to wean himself off the incapacitating opioids prescribed by doctors. But when he wanted to marry his fiancée in the temple, Stoll&apos;s bishop told him that he had to stop using marijuana in order to be temple worthy. "There has not been a harder thing I&apos;ve done," said Stoll, who was married in November. He went back on the opiates and some days struggles to get out of bed. He lost his job and lives in fear of becoming addicted to the painkillers or overdosing. For Aaron Campbell and his daughter Maddie, there is no going back, but the issue is a simple one. "At the very core of it you say, &apos;What would Jesus do?&apos; He would use this plant to alleviate suffering," he said. "The last thing my bishop is going to do is say no. … There&apos;s nobody in their right mind who&apos;s going to say, &apos;Don&apos;t do what you can do.&apos; "